Our skin is the largest organ in our body and it contains lipids which consists a certain amount of fats. Oil is naturally produced on our skin and it prevents our skin from dehydration. Nowadays we use harsh chemical products to remove the oil on our skin. By doing this our skin will produce even more oil. A few months ago I started using natural oils as my moisturizer as well as for cleansing my face. I hesitated at the beginning as I have sensitive combination skin and I was afraid that using oil would contribute to break outs. 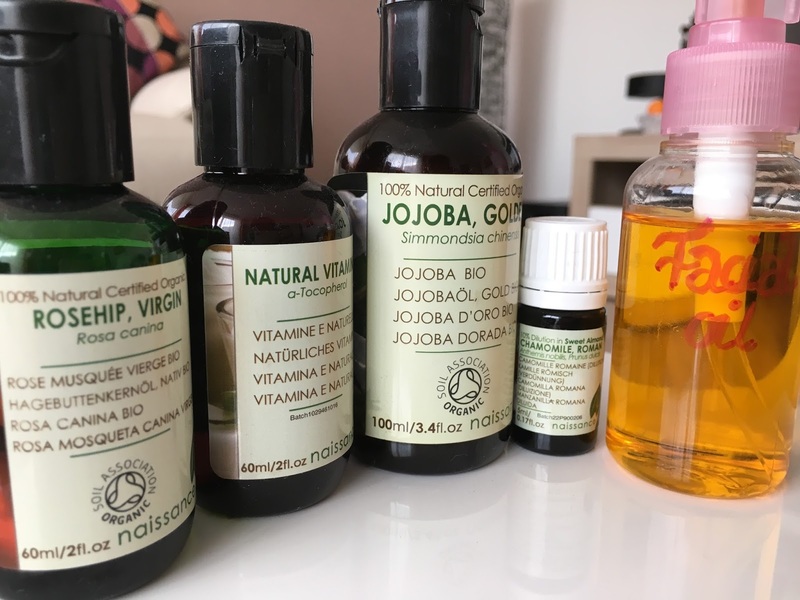 I bought qualitative organic oils to create a facial oil and oil cleanser. After using the facial oil for a few months now I can say that it helps your skin a lot. I used to have wrinkles on my forehead due to dehydration. The fine lines and wrinkles are less noticeable now. My skin has gotten more glow and the skin tone is more even now. The oil has a very light texture hence it infiltrates the skin very fast. I use this oil under my eyes as well and it has reduced my dark under eye circles. This method is a natural way to enhance your natural beauty and obtain the properties of your skin without harming it. Get your glow with this natural facial oil method!